A mid-cut trail runner with street sensibilities, the Mountain Marathon TR Mid first released in the 80s and makes a bold return in 2014 for adidas Originals by NIGO. Restoring the shoe's EVA sole and wraparound Dellinger web and distinctive collar cut, NIGO® takes the shoe's rugged silhouette to the streets with premium undyed leather and a luxurious all-white rendition, accompanied by a one-to-one remake of the Mountain Marathon TR Mid in its original materials and colourway. Finished with flawless accents like two-tone stripes and the shoe's distinctive tread pattern, the Mountain Marathon TR Mid NIGO takes the designer's purist approach to the classics and blends it with a shoe of unforgettable three-stripes style. A straightforward low-top basketball silhouette that was originally released in the 1970s, the Shooting Star model is revived by NIGO for the adidas by NIGO collection. Starting with a classic canvas upper and vulcanized tooling, the Shooting Star NIGO is updated with luxury leather three-stripes and a custom-designed foxing tape, finished with the classic trefoil branding on the collar. Iconic in its design and symbolic of the genesis of performance footwear, the Shooting Star NIGO is a true classic reinterpreted by a pioneer. One of adidas Originals' most iconic silhouettes gets the NIGO® treatment for the Superstar 80s NIGO model. The Superstar 80s NIGO makes nods to the golden age of hip-hop with an foot-hugging inner-sock design and optional extra-fat laces that stay true to the Superstar 80s' straightforward design and natural street style swagger. NIGO then raises the bar with premium un-dyed leather uppers and a selection of three slick colourways that offer a court classic with all of the original bite. With its roots in counter-cultures from the sidewalks to the sidelines, it's a shoe that was just waiting for NIGO's unique approach to aesthetic. As the shoe that started the ZX Series in 1984, the ZX 500 is ripe for reinvention by vintage enthusiast NIGO. Blending classic running aesthetic with the designer's unique perspective on style, the ZX 500 NIGO features premium un-dyed leather uppers with herringbone twill underlays and a unique colour-blocking design with gold accents – a subtle nod to the original colourway of the Instinct Hi model. A carefully-considered blend of the past and the pioneer, the ZX 500 NIGO embodies the spirit of the adidas Originals by NIGO collection. 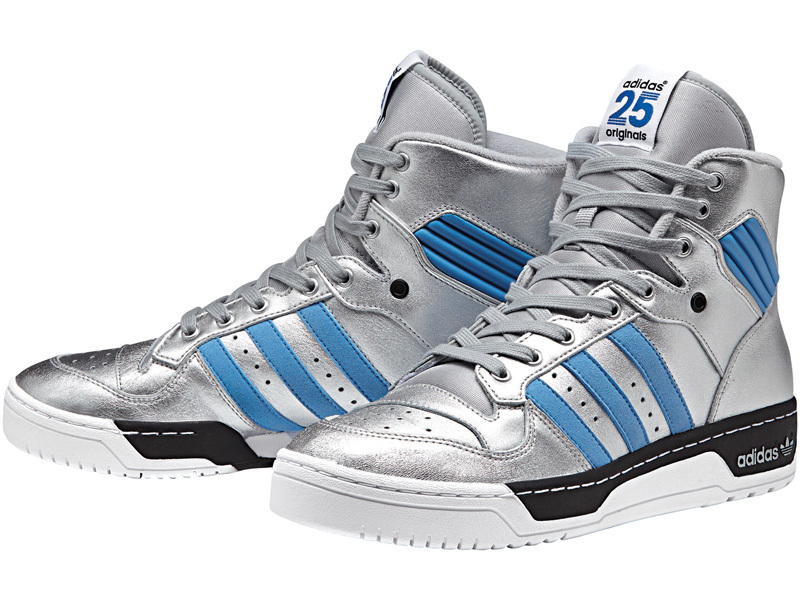 NIGO pays tribute to classic 80s adidas basketball aesthetic with his own rendition of the Rivalry Hi model – specially curated by NIGO as the era's definition of three-stripes style. The high-top model's appearances on the feet of NBA stars has made it an iconic model of its time, and NIGO® brings it back with original street style for the Rivalry Hi NIGO. The Rivalry Hi NIGO comes in a bold metallic upper with contrasting powder-blue three-stripes and collar as a nod to adidas' infamous Micropacer model. The whole shoe is then rendered in premium un-dyed leather with suede overlays and finished with all of the original tech to offer a luxury lifestyle model of an original B-Ball classic. An icon of the sport that continues to bring court and street culture together, the Rivalry Hi NIGO pays tribute to the roots of streetwear and the spirit that formed its foundation. Known to many as the man behind some of streetwear's most seminal labels, few names hit as hard as NIGO. For two decades the Japanese style icon has carved out the landscape of youth culture with his unforgettable clothing and creations, and for Fall/Winter 2014 adidas Originals joins forces with the street pioneer for a special collaborative collection – adidas Originals by NIGO. True to his passion for classic and vintage clothing, NIGO has handpicked and re-interpreted pieces from the adidas Originals archives, blending a sportswear aesthetic with contemporary street style to create new street classics. The apparel collection features unforgettable adidas Originals pieces alongside staples of American sportswear such as coach and varsity jackets, whilst the footwear offers unique interpretations of iconic silhouettes such as the ZX 500 and Superstar 80. With the rich and impassioned history of adidas Originals alongside NIGO's own iconic legacy as a pioneer of clothing and culture, one thing is clear – it will be Original.